We've seen rhythm games that are based around the sensation of playing the piano before. 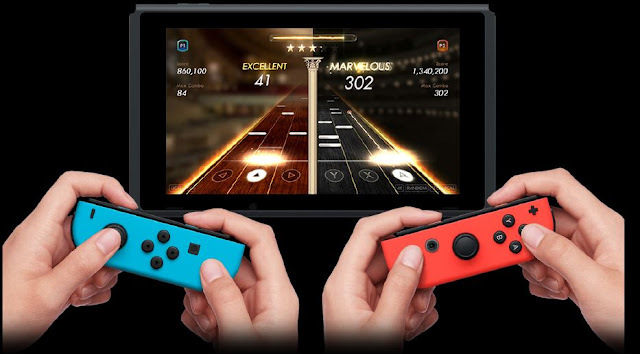 The Nintendo Switch itself has Deemo, in which you play the role of a pianist in every track. 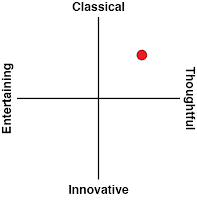 But we've never seen a rhythm game that exclusively focuses on music from the Classical, Romantic, and Baroque eras - what we generally think of as "classical" music that you'd go to a symphony, opera, or ballet to hear. Every other rhythm game might have one or two "classical" pieces of music in there, but Pianista is comprised exclusively of that kind of music. There's 23 different composers represented in the game, from the obvious choices (Bach, Mozart, Beethoven), through to names that are less likely to be familiar to people who aren't studying at a music college (Glinka, Rachmaninoff, Debussy). Each composer has three or four of their more famous pieces represented in the game, and while I'm rather miffed that the playlist doesn't include Beethoven's Symphony No. 7 Op. 92, 2nd movement in A minor "Allegretto" - only the best piece of music ever written - for most people the dozens-strong tracklist will represent a diverse and interesting slice of the history of "classical" music. This game is clearly designed to teach people about the various periods of music history, too - unlockables take the form of piano skins (and, delightfully, these skins take the form of a range of classical paintings), and to earn them, you need to succeed in four-track length "challenges" that are themed - for one skin you might need to delve into the Baroque movement, while another will be focused on a range of waltzes. 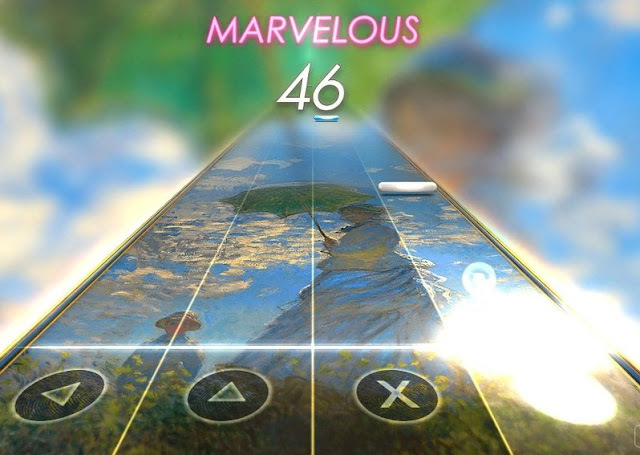 In theming those challenges, Pianista behaves a little like a virtual tour of various musical themes, periods, and concepts, and one assumes that the developers were hoping that one of those themed challenges would catch the eyes and ears of a player and encourage them to go off and learn more about their new fascination. What is most important of all, however, is the quality of the recording itself. Not all performances of a "classical" piece of music are equal, and with most rhythm games, the "classical" performances are comprised of cheap, electronically-produced interpretations, which are amusing enough in the context of the game, but not something you'd listen to in isolation for pleasure. Pianista's recordings are much closer to what you'd expect if you were to buy a CD of recordings, done by specialist performers. The interpretations of each music track are gorgeous, and of a high enough quality that you're much better playing this with a good pair of headphones so you can drink in the richness and power of the compositions. There are two modes of play - the challenge mode to unlock new classical art "skins", as mentioned before, and the arcade mode, in which you need to complete three different tracks of music, with the combined score earned from those performances (the more accurate the performance, the higher the score) then going onto the leaderboard. There are three levels of difficulty, and it's possible to play with four or six "keys," - naturally the more keys, the greater the challenge, and any difficulty beyond "normal" has the capacity to get very challenging. The other mark of a good rhythm game is, of course, how well the beat maps - the order in which the notes fly onto the screen - pair with the music. 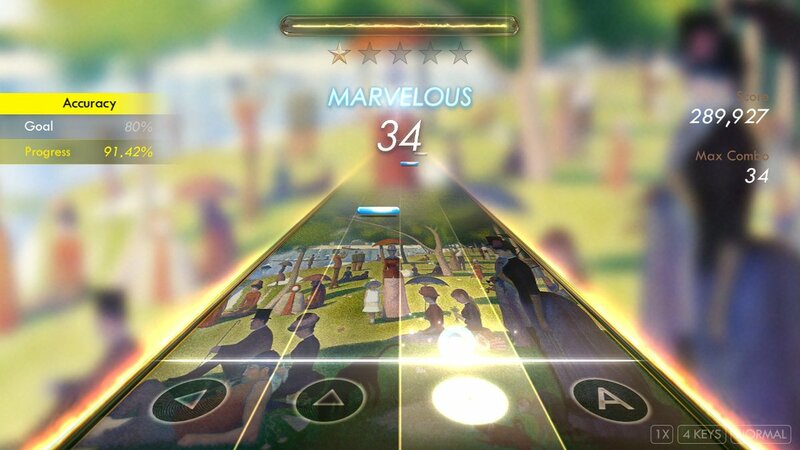 If you feel like you're part of the performance, then it's a good rhythm game. 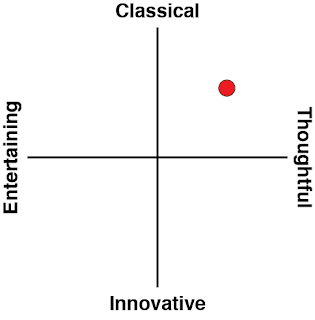 Pianista certainly gets there. 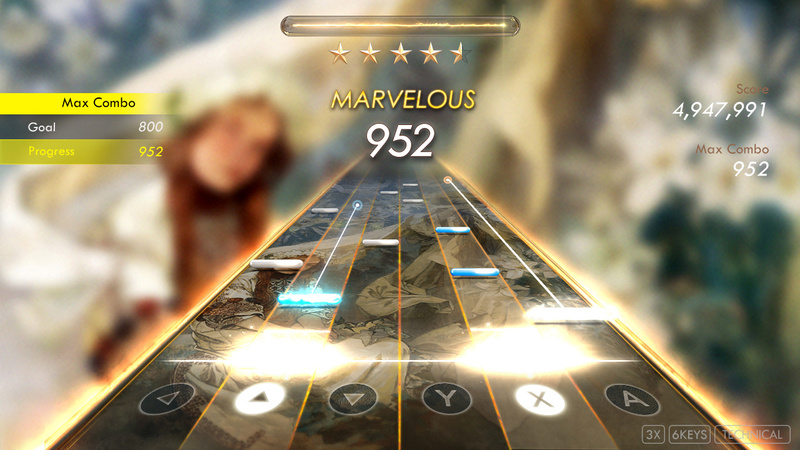 On the lower difficulty settings, notes are mapped to the most important notes in each music track. On the higher difficulty settings you'll be tapping along with so many more of the minor notes to go with those highlights. These beat maps feel really good to performa, and interactive with the music itself. Amusingly, if you miss a note, the subsequent "hit the wrong note" sound effect is large and jarring and very much ruins the overall sense of performance, just as it would if you went to a concert hall and the pianist there messed up completely. Unfortunately - and this is really my one criticism of Pianista - the beatmaps are also clearly designed for a touch screen and to play by directly interacting with the screen. At the moment, on the Switch, the only option is to play with buttons, and I find that this makes the higher difficulty settings, where you need to trill, almost impossible. Adding in a touch-screen option is something for the developers to think about with a patch, I think. Pianista is also quite unforgiving. Miss just a few notes across an entire track, and a dreaded "Game Over; practice makes perfect" screen will pop up. I have nightmares of that, from back when I was learning piano and the whole "practice makes perfect" phrase became a mantra that I could look forward to hearing drummed into me in every lesson. Scores are only recorded after completing all the tracks in a set though, so this also makes Pianista a remarkably unforgiving and demanding rhythm game. That sits well with the kind of discipline and control that is required of actual piano playing, but it also doesn't make for the most accessible of rhythm experiences. The other thing that some players might find difficult is the lack of a distinct drum beat. Piano is, of course, a percussion instrument in itself, but most rhythm games tie the action to the drumbeat, and Pianista might involve a degree of "re-learning" from that perspective. It's worth it, though, because "playing along" with classical music like this can only help your appreciation of it. As a nice little bonus, there's also a brief history of each composer included in the game's "library." None of the information in there is stuff you can't find in a more comprehensive manner from even a source such as Wikipedia, but as Pianista is best thought of as an introduction to this music and these composers, that little bit of context will hopefully encourage people to go out and do more research once they've found their favourite composers. I've always been a big fan of games that are informative, or at least inspire people to want to go and learn more, even as they entertain. There is a glut of rhythm games on the Switch already, but none of those subsequently inspired me to pull out my keyboard and brush up on some of the music that I've learned over the years. Pianista did, and while it might not encourage you to take up music lessons, at the very least you'll walk away from this with a better sense of "classical" music. That is something valuable.